Here they are! 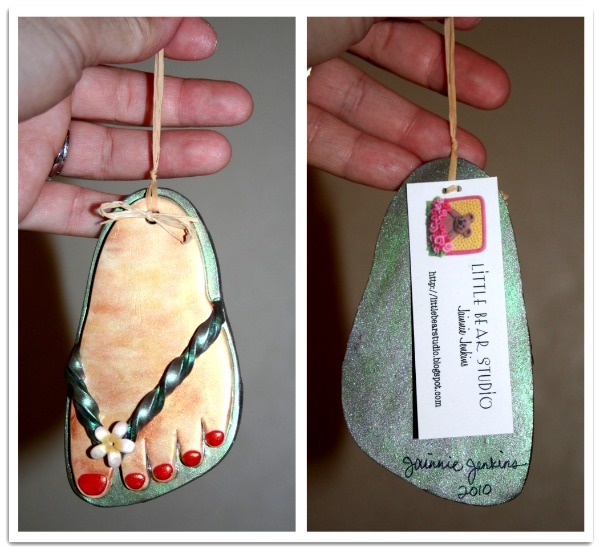 I finished up the slipper ornaments for the PPPCG swap. We needed to make 11 -- 10 to swap and 1 for the silent auction (I think 1 from each person will be put together into a group and that will be auctioned). After making the first slipper incarnations, as seen in my previous post, I got these down a little better. Made a template for the slipper "sole" and decided on twisty straps and plumeria flowers. I also chose reddish/orange/purple for the toenails and tried not to go overboard with using pearl ex! I'm pretty happy with these and hope my guild members like them as well!! The raffia was used in place of ribbon, and I attached a tag I made with a little raffia bow. I'm just very happy with myself right now, and will be even more so when I get to making more of these for holiday gifts. What's nice is that these do not have to be used as an ornament, per se, but could be a cute decoration on your wall or cubicle...to remind yourself to save up those pennies for your next vacation to Hawaii! These are so cute Jainnie! They turned out beautifully. And I love the idea of using raffia instead of ribbon...it's the perfect finishing touch! Thanks, Suzanne! I loved your little mouse in a walnut shell! !